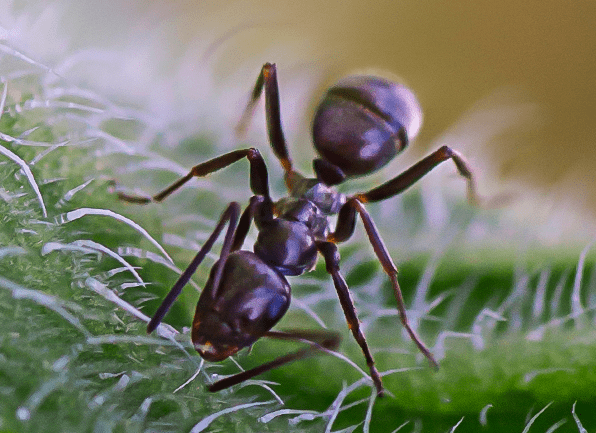 Odorous house ants are among the most common ant species encountered by homeowners in the Midwest. They are extremely difficult to control due to their nomadic inclinations, omnivorous feeding practices and large population sizes (thousands of individual ants per colony). Odorous house ants forage day and night along distinct, usually detectable trails. These trails are typically used to travel between nesting and feeding sites. These are small, black, shiny ants that are about 1/16 to 1/8 of an inch long. These ants emit a pungent odor when crushed. They communicate with pheromones (insect communication chemicals). Colonies grow large (thousands) with multiple queens (egg-producing ants). These ants are numerous in and around structures and generally form distinct trails. They're opportunistic nesters and will nest almost anywhere. They feed on sweets, dead animals, and other insects. They feed on fluids excreted by plant-feeding insects such as aphids and mealy bugs. They will run erratically with their abdomen extended in the air when disturbed. Remove food and moisture sources (i.e., leaky faucets and hoses, pet bowls). Mulch should be less than 3-inches deep; gravel perimeters are best around a structure. Remove leaf litter and yard wastes from the foundation of a structure. Don't stack lumber, firewood, bricks or other debris next to the foundation. Treat plant-feeding insects with appropriate insecticides. Wash ant trails with a mild detergent to eliminate pheromone cues that attract other ants.